Sheridan, Maj. Gen. Philip H.; three-quarter-length, seated. 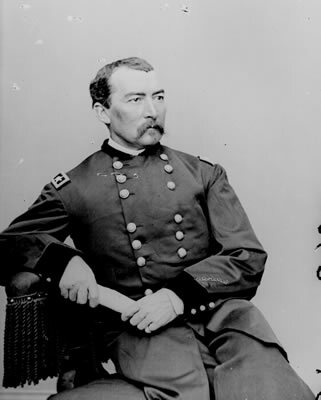 Philip Sheridan was a major figure in the military history of the United States in the latter half of the nineteenth century. Sheridan was born on March 6, 1831, in Albany, New York. His parents had immigrated to the United States in the year before Sheridan's birth. In 1832, the Sheridans settled in Somerset, Ohio. Philip Sheridan's father, like many other Irish immigrants, found employment on the canals and railroads. He was often away from home, leaving Philip to be raised by his mother. Philip attended common schools and, beginning in 1845, found employment as a clerk in local stores. Sheridan received an appointment to the United States Military Academy at West Point in 1848. He was suspended for the 1851-1852 school year for a conflict with another student. He graduated in 1853. He had military assignments across the United States, including Kentucky, Missouri, Texas, Oregon, and California. By the outbreak of the American Civil War in 1861, Sheridan had attained the rank of captain. Sheridan served in the Union Army during the Civil War. In the first year of the conflict, Sheridan served principally in Missouri as a quartermaster with the Army of the Southwest. In 1862, he participated in the Union's offensive into western Tennessee and Mississippi. He was commissioned a colonel in May and then led a cavalry brigade in several skirmishes in Missouri. By the fall of 1862, Sheridan was promoted to brigadier-general and was operating with the Army of the Ohio. He commanded the Eleventh Division and participated in the Battle of Perryville. Following the dissolution of the Army of the Ohio, Sheridan became commander of the Army of the Cumberland's Third Division and was promoted to the rank of major general. In 1863, he participated in the Battles of Chickamauga and Chattanooga and helped secure eastern Tennessee for the Union. In April 1864, Sheridan became the commander of all cavalry forces operating with the Army of the Potomac. While he had demonstrated his competence on the battlefield well before this point, it was Sheridan's activities with the Army of the Potomac that earned him fame as a military leader. Sheridan drove General Jubal Early's Confederate army from the Shenandoah Valley in the fall of 1864. He turned the Battle of Cedar Creek from a Union defeat into a victory by rallying Northern soldiers fleeing from the fight. His actions at Cedar Creek were immortalized in a poem, "Sheridan's Ride" In the years immediately following the Civil War, schoolteachers often had their students recite this poem. After completing his campaign against Early, Sheridan and his command participated in the siege of Petersburg and the surrender of General Robert E. Lee's Army of Northern Virginia at Appomattox Court House in 1865. Following the Civil War, Sheridan commanded the Military Division of the Gulf of Mexico from 1865 to 1867. In March 1867, he became commander of the Fifth Military District of the South. The United States Congress, against the wishes of President Andrew Johnson, had divided the South into military districts. The Congress wanted to maintain a military presence, primarily to maintain law and order and to defend African Americans from southern whites in the states that had seceded from the Union in 1860 and 1861. Sheridan commanded troops in the Fifth Military District for seven months in 1867. Following this assignment, Sheridan took part in the wars against the American Indians then underway in much of the Western United States. Upon General William T. Sherman's retirement in 1883, Sheridan became the commander of the entire United States Army. He died five years later, on August 5, 1888, after becoming ill while traveling in the West. Hutton, Paul Andrew. Phil Sheridan and His Army. Lincoln: University of Nebraska Press, 1985. Sheridan, Philip Henry. Personal Memoirs of P. H. Sheridan, General, United States Army. St. Clair Shores, MI: Scholarly Press, 1977.